One of the primary functions of an engagement ring is a message to the outside world: “Sorry, spoken for.” But rings say so much more than that. To some folks, having a big ol’ diamond on your ring finger says something about your ethics. But let’s face it, to other people (A LOT of other people) the particulars of the ring of your finger say something about your social status. There’s pretty much no way around the fact that at least some portion of the people who see the ring on your finger are going to quickly calculate some guess as to how much that ring cost, and extrapolate from that a judgment about your economic status, your social class, and by extension your entire life. This pulls both ways! I have an acquaintance whose ring features probably the biggest diamond I have ever seen in real life that is not cursed. This diamond is so big that it can sometimes be hard to look her in the eye during conversations. Her diamond makes me feel like a horny fourteen-year-old boy talking to a woman with large breasts. I cannot speak to her feelings about that ring, but I can just say that having such a gigantic diamond on my finger would probably embarrass me in certain circumstances. Plus I figure it will eventually cause curvature of her spine. On the other hand, many people sweat the smallness of their diamond. I’ve certainly heard women with smaller diamonds refer to them as “starter rings.” I think that is because, at least for young people in the US, it is acceptable to be currently poor as long as you plan on future wealth. And for the provider of the ring (often a man, bringing in a new mess of gender issues on top of class ones), the status message can be just as, if not more, important. My cousin Rocky, who coincidentally got engaged the night before Collin and I did, explained to me last Thanksgiving that despite his low salary (he’s a detective in Baltimore) he feels (felt? I’ve painted myself into a verb tense corner) obligated to buy an obviously pricey engagement ring because he drives a Corvette. He wouldn’t want anyone to think his car was worth more to him than his wife. That kind of made me want to barf, but at the same time I couldn’t deny that it made a certain kind of sense. The diamond on my ring is around 0.7 carats. I think this is a fantastic size, the perfect size, because it is the size I actually have and OMG I LOVE MY RING. My guess is that is on the small end of the average range? I don’t really have a basis for this other than the skewed sample of law school people and the nonsense that is published in advertisements in bridal magazines. Internet research on this subject has, unsurprisingly, produced a wild variety of answers. So… all of this has basically been a preface to showing you my engagement ring. In so doing I feel obligated to linking to the designer, which will give any gumshoe readers the opportunity to calculate approximately how much it cost. This makes me uncomfortable: For some people the cost will be too great! For other people the cost will be too little! But… that is what this whole post is about. I wear this status indicator every day, and now I am putting that signal on my blog. Even though it is squirmy. Don’t people know that the way to establish your socioeconomic status is by carrying a Starbucks cup and not by wearing a diamond ring… sillies. Ok. Seriously now… NEVER heard of a brown diamond. But now I’m intrigued. Your ring is teh sexay. And think about how many lattes you can buy for the price of one diamond! Ooohhh, perty! Are the stones in the band little teeny brown diamonds, too? And, yes. I actually have a draft of pretty much this same post marinating in a Word doc right now. Thank you for writing it for me! No, joking. The ring-as-social-status-indicator thing is tricky water to tread, indeed. I can’t help feeling, at times, like I am going to barf as well. And yet I am an active participant in a certain kind of class image. Oh, the betwixt and between! It’s a haunting, amusing place sometimes. Thank you for posting this. I am strongly considering posting a picture of my own. Thou hast given me strength, grrrrrl. You are certainly welcome; I posted this pretty much entirely in response to wanting to see your ring after reading your latest post! The little diamonds actually make a very subtle transition from brown to “champagne” to clear. Allegedly Collin was the first person working with our jeweler to do a fade from dark stones in the center to colorless stones on the sides. It was no small feat for the jeweler to find the perfect spectrum of tiny diamonds. She also thought to procure some extras for the wedding band, which is going to fade from brown on the outsides to colorless in the center. I think this detail makes me love your ring even more. The design and intentionality of it is almost as pretty as the immediate “ooh prettiness” of it. Yeah, I concur. The transitioning color of the stones is super awesome. Love how it’s the reverse on the band! Thanks, Viki! One thing I love about it is how much thought Collin put into it, and what a good job he did making it so beautiful and so right for me even though I never wore jewelry. I think he really showed his hidden artist, which he must have gotten from you! hahaha!! I love the ring up the nostril thing! I have also refused to put up a picture of it. My diamond came from my mom’s engagement ring and I have avoided asking what the actual carat size is. If I don’t know, I can’t tell anyone when they ask and can sort of avoid judgment. Its great. This is a situation where ignorance sounds like a nice solution! 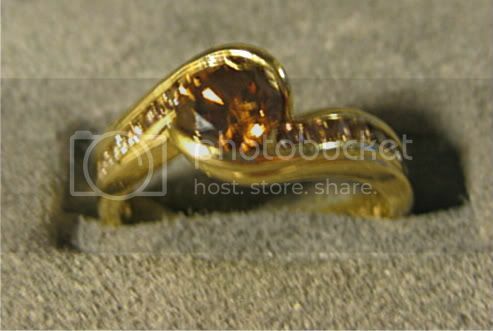 Your ring is so very pretty (and I now understand the brown and gold brooches for your bouquet! It’s all going to be so gorgeous). I knew someone who had a diamond so big you could see it at night across a crowded room. She talked a lot with her hands. I think it was 4 carats. It was very important to her. I think my engagement ring’s center stone is about .7 carats, too. Then I have two small square cut sapphires (one on either side). It’s a lot smaller than the rings the other women in my office wear, and I love it. It’s light and comfortable, the basket isn’t too high that it gets caught on anything, and it’s just so very pretty. This is a forever ring, not a “starter” ring. Thank you! Yes, I am so excited about having golds and browns and similar shades appear all through the wedding. LOVE your ring. Like other commenters, I had no idea there were brown diamonds. My carat weight is 0.25, and people on Weddingbee regularly make me feel like a pauper about it by posting “sooooo disappointed” threads about how their engagement ring turned out to be just a carat or something. Meanwhile I wonder how they manage to finance this bling, because I know how much my ring cost, so I’m forced to assume theirs is either cut by a third grader or could have bought a car. I wish I had a more unique ring, but at the time I picked it out I had not yet discovered that engagement rings are still engagement rings if they’re not 3 stone white gold diamond ones. Thank you, also, “cut by a third grader or could have bought a car” made me laugh so hard I scared the cat. Your ring is really lovely! I have a hard time with the size thing. My man bought my ring when he was in grad school…he worked a 3rd job tutoring math students to pay for it. He did extensive research to learn all about clarity, blah blah blah. And I ended up with a gorgeous, sparkly, princess cut .52 carat solitare. That I love deeply. And I have gotten the “wow, it’s on the small side nonsense.” Which is just disgusting. The best way I see to deal with it is to avoid the assholes who think it is acceptable to be mean about something so silly as ring size. I would say something like, “your tact is on the small side!’ It sounds like you are way more diplomatic, though. The whole ring culture blows my mind. I’m petite and tend to wear small jewelry, nothing big or flashy. Yes fiance and I are young and poor but I could never see myself wearing a big diamond ever. So a small stone just made sense. Mine is also a rough diamond, uncut, because I like the more organic look. Bonus, it is cheaper. And for our personal ethos, we went with conflict free and recycled gold.